Every time we need to serve something related to food and beverage, we take help of trays to deliver the food items and refreshments to our beloved ones in home! 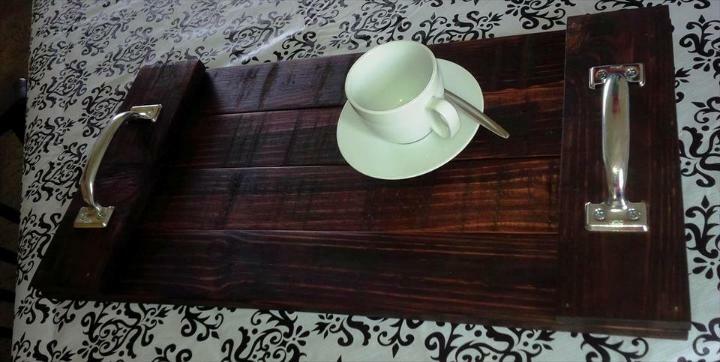 You can build all different kinds of trays using free pallets like the serving trays, trays to hold the dining table spices and also the custom breakfast or laptop trays! A custom one has been given here that is also for sale and has been done by Stevensville Pallet Projects and you can take a look at the total cost price and material used here! 2 Feet long and 1 Foot wide, this sturdy re purposed pallet serving tray is stained in Minwax Red Mahogany and it’s BEAUTIFUL! Only asking $30, so first to comment “Sold” in the comment section below owns it! As always, likes and shares are appreciated to help spread the word! Beautiful pallet recovery!!! It is also a nice way to get crafty with pallet leftovers! 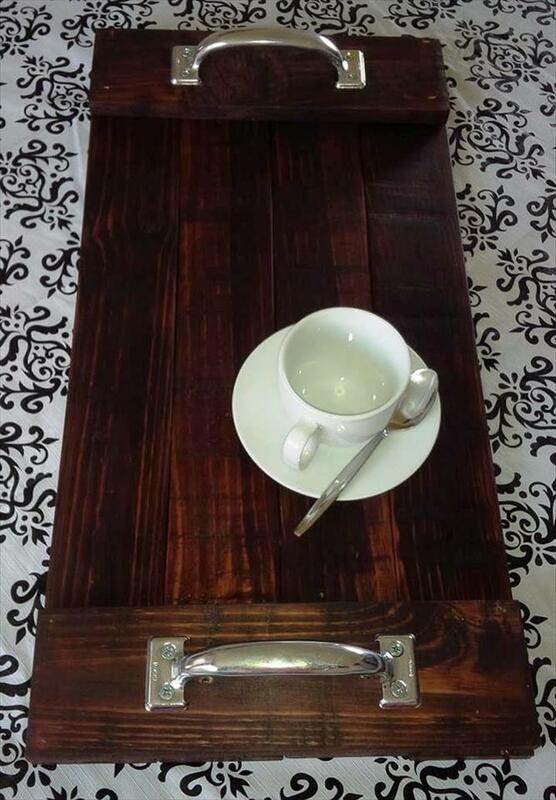 One can also prefer stain coats in any other shade to vary the final wooden appearance of the tray! It is all perfect to serve the breakfast to your lazy family members who just love to be on bed longer in the morning! Old door handles and drawer pulls can also be added to this wooden tray for easy and safe carriage! 5 slats of pallets will be enough to clone this precious wooden tray, also build the laptop trays and dining table spices trays out of pallets!